In the fall finale, “A Furnace for Your Foe,” Empire was at the top of its game with Cookie’s exploits, the seeds for a brutal family feud, sharp dialogue, good music and all the outrageous, over-the-top drama we love. Let’s go! Mayoral candidate Angelo Dubois and Cookie’s class-vs.-sass storyline is on display during a beachside rally at what appears to be Coney Island. Nobody believes that the bougie politician will represent them; a white extra and Judge Judy devotee heckles him: “Don’t pee on my leg and tell me it’s raining.” Cookie saves the day with an impromptu change of plans. Instead of that ritzy Captain’s Ball fundraiser that Angelo’s mom planned, there will be a People's Ball, a star-studded outdoor concert. Lucious: Ma? What are you doing? Leah: The same thing she’s doing, but I’m sucking the dirt out of the rug. Lucious and Angelo’s mom, Diana Dubois, plot; she needs him to lean on a journalist who is about to expose a secret, which will torpedo her son’s political future. In return, she’ll break up Angelo and Cookie. Lucious comes through on his end by having Sticky Fingaz rap a scary threat to the journalist. Diana doesn’t hold up her end of the bargain because Angelo’s favorability ratings are up with what pollsters call “the Cookie effect.” Watch your back, Diana. I love the Bad Andre storyline, but I’ve been concerned that Empire would ignore his bipolar disorder. It doesn’t. Andre, who was riding high, crashes into a depression. Andre tells Nessa about his condition; she’s understanding. It’s time for Andre to let go of Ghost Rhonda. At the beach, Rhonda gives him a tender goodbye by lovingly reminding him, “You are the most ruthless of the Lyon sons.” She makes him vow to turn Nessa into a star and take control of the company. She also wants her husband to destroy Boo Boo Kitty for killing her. Oh, Rhonda, please don’t go! She goes. She walks right into the ocean. The tiresome FBI agent Tariq continues to be tiresome and obsessed with bringing down Lucious. Everyone in the FBI office gives Tariq the side eye when Lucious reveals that they are half brothers. Thanks to agent Tariq, Empire’s assets have been frozen. Shyne steps in to help Lucious in exchange for a stake in Empire. This will lead to no good. Cookie has plumbing skills. After she dumps Jamal’s pills down the drain, he goes into withdrawal. Cookie scoots under the sink in her Cookie-licious outfit, takes the pipe apart and gives him some pills so he can perform. Astonishingly, the concertgoers are into the Hakeem-and-Tiana relationship; the fans call them “TaKeem,” so have fun with that, black Twitter. The concert is a hit. Jamal does a terrific job, so that’s that with the PTSD. 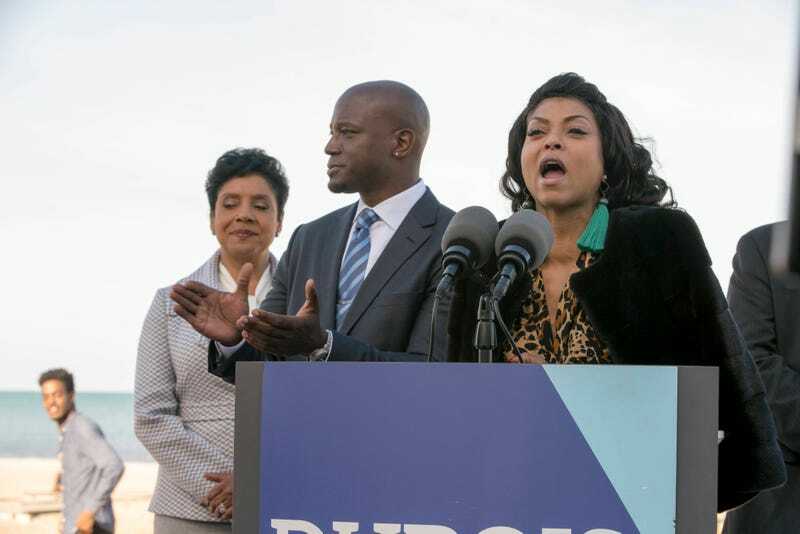 Cookie and Lucious hold a backstage intervention and order Jamal to go to rehab. He says, “No, no, no,” but he’s going. No surprises there. OK, on to the climax. Mrs. Dubois shouldn’t have crossed Lucious; after the concert, he brings along a reporter, who sticks a microphone in Angelo’s face and confronts him about some scandal. Angelo is besties with Vladimir Putin and he’s been hanging out with Kanye West. No, not really. When he was young, he got drunk and ended up crashing his car in the water and left a girl to die. If Teddy Kennedy could bounce back from it, Angelo will be fine. I didn’t think Angelo was going to last past a few episodes, but he should stick around. Cookie needs a real romantic relationship and a worthy adversary—she gets that with Angelo and Diana Dubois. Phylicia Rashad is a gem and has chemistry with Taraji P. Henson. Andre’s in an elevated mood again and he’s coming for Lucious. Andre plans to kill his dad! Will that happen? Not likely. But a resentful and unhinged Andre seeking vengeance is juicy. Just please drop the FBI investigations. They’re boring and don’t accomplish anything. Cookie is the most important character; the show falls apart without her, so let’s explore those intriguing flashbacks to her earlier life. Cookie spends her time reacting to and fixing things. Seeing Cookie move in new circles adds dimension. Remember how hurt she was when those heifers at the opera called her a hood rat? Before Lucious, Cookie was on track to a different life. Let’s see what happens when those worlds converge. Lucious has relatives popping up every time you turn around; let’s see more of Cookie with her sisters. Empire is setting the stage for a great second half of its third season. March can’t come soon enough.